I know a little about cones, more from my experience with geometry than from my experience as an occupational therapist. 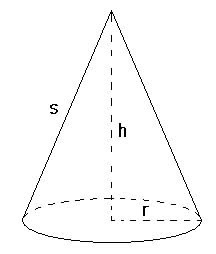 A cone is a three dimensional geometric shape. It is the locus of all line segments between a base and a point outside the plane. I know that the base of a cone can be any shape as long as it connects to an apex at any point outside the plane of the base. As far as I know there is nothing in her home that is cone-shaped. I don’t know if they have ice cream cones right now – I guess that would be an exception. However, the dog would probably eat it long before someone got to it with a long handled reacher. Anyway, I think it is fair to say that nothing that is cone-shaped regularly finds its way onto the floor. When I think about the things that people do have to bend to pick up, I think that clothes get dropped on the floor all the time. A magazine or the television remote control probably gets dropped. Tupperware and Tupperware lids always seem to fall out of my cupboards onto the floor, but I don’t think that any of those are cones. So why do occupational therapists have such a fascination with cones? I suppose I should be thankful for small favors that my family member is not stacking cones. We are still waiting for the OT to start teaching her how to get dressed and use the bathroom. How long should I wait before I ask? Some present an argument that it DOES matter what is on the floor. This is a good PT/OT philosophy delineation issue, so thanks for your comment. Nelson. D. L. (1988). Occupation: Form and performance. American Journal of Occupational Therapy, 42. 633-641. Cones! where is the evidence that shows isolated random stupid activities have any relationship to occupations? Any OT practitioner out there should reconsider using cones and seriously ask the question WHY do you use cones? Where did the common tool use of cones originate? Please, lets use occupations in our daily interventions. Without the use of occupations and documenting occupations, are we still occupational therapy?